Once again it was their previous match result that mattered most as Solomon Warriors went through despite drawing 2-all with Koloale. Their 3-1 win last weekend ushered them through to the semis with a win by aggregate of 5 goals to 3. Solomon Warriors looked threatening from the get go and were in front after the quarter hour mark with Micah Lea’alafa beating stand-in goalkeeper , Joseph Komu, from a free kick. Lea’alafa’s shot was straight at the goalkeeper who had the ball in his hands but fumbled it into his own goal when he went to ground. The lead was extended in the 24th minute from a penalty kick after a foul by Leonard Olea on Lea’alafa. Dennis Ifunaoa was called in for the kick and he put his shot past Komu at the bottom edge of the right post and Solomon Warriors were comfortable with their lead as they went for out for the breather. The second half was harder for both sides with the rain making the surface slippery and Solomon Warriors’ typical quick short passes became unworkable. Koloale, on the other hand, used the conditions to their favour by using long individual runs into the Solomon Warriors penalty box but their efforts at goal lack direction. However, Atana Fa’arodo Jnr. on one such run was given too much space by the Solomon Warriors backline and he placed his shot past the advancing Anthony Talo to score. Robert Laua then scored the equaliser four minutes later with a driving run into the penalty box and a neat finish past Talo after drawing the goalkeeper to the left and finishing with his right. Marist were severely disadvantaged going into their clash with Western United following their 7-0 trouncing in the first and required an eight to nothing victory for them to win the tie outright. There was no sign of giving up from Marist who came with all guns blazing from the kick off. Western United were shaky from the start and the absence of Nelson Sale created a gap in the defence which was repeatedly breached by the quick Marist forwards. Despite the best efforts of both clubs the first ended nil-all with Western United looking more worried than their opponent. The crowd also by this point had, in typical Lawson Tama fashion, rallied behind the underdogs Marist and showed little love for Western United. Marist, in the 74th minute, went in front courtesy of replacement Fredrick Fafale, who crossed in for Amos Ronnie to finish. Three Western United defenders were there to deal with the threat but did not and Ronnie, who was almost unmarked, had the time to beat the ball into the back of the net with ease. Facing an embarrassing defeat Western United shifted players around and finally equalised in the 84th minute with a header from Jack Wetney after a free kick from Totori. The league champions could finally taste victory at this point and Joses Nawo wrapped up the win at the end of regulation time for Western United to go through 9-1 on aggregate. 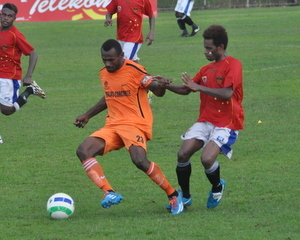 Western United are scheduled against Hana for the first semi-final to be played on Saturday and Solomon Warriors will take on Real Kakamora in the second semi-final on Sunday.